So the school year is about to begin! This coming week all the kids at schools in Manhattan will once again be spending their days inside a building that was designed to help them learn, filled with lots of people who want to help them grow up, teaching them practical information about themselves and about the world. One thing that will be taught, especially in elementary schools, are the rules. The rules about everything—the rules about adding, subtracting, dividing, multiplying; the rules about spelling and grammar; the rules about the earth and the sun and the universe; the rules about how to behave in the classroom, or on the playing field, how to behave with friends, adults, and other people you don’t even know. There are a lot of rules to learn when you are a kid, and sometimes it can be overwhelming, and sometimes it feels like the only thing that matters in life are the rules that someone else has made for them. Kids struggle with some of those rules—especially ones like not talking in class, or staying seated to do something that for a kid is really boring. Rules are important. We adults all know that. To be really good at some things and to get ahead, you have to know and follow the rules. To be fair and just, for there to be peace and progress for all, we need to have rules that we all agree upon and pledge to accept. But school is about more than rules, isn’t it, especially as you grow older in your education. In some ways, a really good education should also teach you when and how to break the rules. 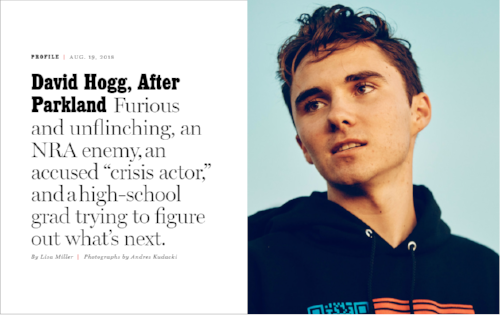 The current issue of New York magazine features a lead article about David Hogg, one of the students who endured the terror of a shooter in his Parkland, Florida high school, where 17 young women and men were killed on Valentines day. The tragedy of that day prompted David to defy the rules of his parents, his school and his community by brazenly and loudly calling out public officials for pandering and sucking up to the NRA for campaign contributions, making himself a potential target for the anger and the violence of gun-obsessed strangers across the country. David has become a spokesman for a radicalized young America, breaking political and social rules to campaign against the fear that enshrines firearms as a birth rite of Americans. Reading the article, it was hard not to make a comparison to John McCain, another survivor, who earned a political reputation as a rule-breaker and maverick following his 5 year imprisonment and torture at the hands of the North Vietnamese. Perhaps it is more commonly at the university level that students are challenged to look deeper into the rules of life, to understand how they are meant to bring order to one’s life and one’s community, but also to investigate and question how rules and codes and customs may be used to obstruct, impede and hide the truth. I always enjoyed freshmen move-in day at the university where I taught. It’s one of those key moments in life—a great change in life that parents and their beloved daughter or son all share together. For the parent, it’s kind of like pushing a boat with your child in it, sending her out into uncharted waters, waving to him from the shore as he sails farther and farther away, and there’s not a lot you can do any more to make the journey safer. Hopefully the most important rules have all been taught, especially the ones that will help them survive away from the loving care of their mothers and fathers. And for the child, out there in that little boat, it’s exciting to look out onto the vast ocean and imagine all the adventures, but it is also very scary. Who knows what lies out there upon the high seas. It is exciting, and it is hard, but out of such moments, new life is born. The ‘job’ for students in college is to try to get their hands around the whole truth, to embrace it all, to try to take it all inside. Which means they need to walk around the world—figuratively--and see everyone’s truth. So you open your arms to the truth, and you begin to see that it’s much bigger than you ever thought, you realize that you only possess a small piece of it, but that to be a fully human being, you need to open yourself to the great mystery, that in the end, I believe is the mystery of God’s truth. To embrace the truth, you need to be compassionate, you need to ‘feel with’ the world in the way God ‘feels with’ the world. To know what it feels like to be a little and vulnerable child who is the victim of abuse at the hands of adults and peers; to know how it feels to be giddily in love for the first time, and when that first love turns to heartbreak; to feel the injustice that is inflicted because of prejudice against people who are different in color or thought, or sexuality; to feel the sorrow of those who are mourning, the joy of those who are achieving, the confusion of those who are aging, the anger of those who are unhappy. But that’s not just the challenge for college students. It is also the job for anyone who calls themselves a Christian. And when you try to do that, to open yourself to God’s truth, you realize that you don’t really know anything at all. When you open your eyes and your heart to God’s truth, you see the world very differently. Embracing it all, like this, requires a divine sort of love. See what it looks like, up there on that crucifix, and what it can do to you. When you try to pursue God’s truth, like that, you can wind up crucified for not following the small rules, which in the end don’t really matter at all. In the Hebrew Bible Moses tells his followers that the following ‘the rules’ is important: “Observe the commandments of the Lord carefully, and you will give evidence of your wisdom and intelligence to other people… “. But in the Gospel there is another lesson. The learned Jewish priests challenge Jesus because he and his followers are not following the rules and customs of the people of Israel—in this case, specifically, they are failing to perform a ritual hand-washing before they sat down to eat. For these priests, the rules had become more important than the purpose for which they were originally created, and of course they were a way to get at Jesus, the rule-breaker. They use this as an excuse to take him and his followers down. Jesus doesn’t really address the specifics of it. Instead, he challenges the religious leaders to ask themselves if they are following the meaning and purpose beneath those rituals… the bigger truth. It’s so risky to do---going about your life with your arms and your heart open like this. You might have to change, get bigger in heart and in mind, let some things go because they’re too small and don’t really matter. And sometimes you have to deliberately break the rules. You know, most of us learned about our Catholic faith when we were growing up, during those days in grade school and high school when we were also learning how to behave in class, the rules of English grammar and algebra and earth science, and the rules of every game we played from baseball to soccer to hide and seek. But a lot of us never went any farther, any deeper. When we were confirmed, it was like graduation, and we were not encouraged even by the church to go deeper in our understanding of our faith, or more importantly in our relationship with the one it is all about—Jesus. Think about your relationships with people from your childhood. If you still have them, it is because you invested in the deeper truth of your friend. You didn’t stay at an elementary level with them, because if you did, I guarantee they are no longer in your life. Authentic love always invites you to go deeper, to share more authentically and compassionately and selflessly, bravely letting go of ‘the rules’ that may be expected at times. The same is true with our relationship to Jesus. I am convinced that one of the principal reasons for the sinful mess the church is in right now, perhaps the primary reason we have had predators among our priests and bishops is because they failed to go deeper in their faith relationship with Jesus. The more you invest beyond the rules and codes of the faith, the more you risk your love on the One who hung on that cross, the less you are liable to fall into a sinfulness that is based on fear. All of us need to recommit ourselves to a deeper faith, a courageous deeper education about what it means to be a Christian and a Catholic. This year at Epiphany, we will try to offer many opportunities for everyone to go deeper. Shall we all go back to school this Fall, and learn deeper lessons of love to which Jesus invites us?